The Mokes in Belgium out for their first IMD. 19 MOKES!!. Can anyone beat that? The most successful IMD ever. I turned up at 10 to 10 for the official time of 10.30 and already there were 4 Mokes and they just kept on coming. Some I had never seen before and some who had been on the trip to Alice, Shepparton or Wagga. We had a good day out we came across some very very heavy rain but we stilled carried on. The drive was fun but would be great in the dry, as seeing out of the windscreen at time was difficult. Parked out side the Pub at Wollombi and had a bit of a look around.When we got back to the pub it was quite full so Smokey as I decided to travel to Cessnock for Lunch before heading home. With other plans having fallen through, we decided to go it solo today. The weather was impossibly bleak, pouring rain and miserable, but we made the most of IMD anyway. We did a round trip of around 130kms, travelling from the Coast over 2 mountain ranges, through picturesque Kangaroo Valley and onto Fitzroy Falls, and then back home again. IMD started out a little chilly in Hobart but quickly turned into a sunny fine day (although there's still a bit of a nip in the air). We had one of our best turnouts with 10 Mokes, many of them coming along for the first time. We started off with a short run out of town, then headed into the foothills of Mt Wellington. Bruno and Jean Georges put on another pretty big effort for the Mokes of France with a cruise to St Tropez and are really lifting the bar for International Moke Day events. No story as yet but a gallery of some very nice Mokes and a link to a local newspaper coverage of the event. 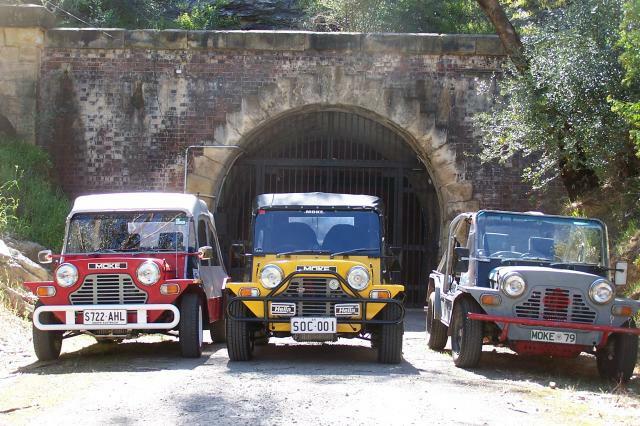 International Moke Day started in Adelaide with a meet up with the South Australian Moke Club to view the Bay to Birdwood while some others took a short cruise and visited some Moke works in progress. Reports and pictures by Dave and Pete. Still looking for images of the some of the other Mokes that watched the Bay in a Day. Here i am on IMD 2011 with the event i was planning on cancelled due to wet weather, (we have had about 20mm here this morning) so I thought i might add a bit to the thread. i was a bit dissapointed that the day was cancelled because was going to meet a few forum members for the first time, Oh well that will happen in good time. Well here we are again, IMD 2011. Unfortunately many in this area are away or working and then some have "Mokes in Progress" like all areas I'm sure. Team Queensland got fitted out in lovely new shirts for this years International Moke Day as they took a drive up into the Mount Tambouine area. Dean and Moke2B share there pictures and thoughts on the day. Not able to be a part of the large turn out of Mokes in Perth, Grant, aka Maddog, spent International Moke Day mowing his lawn.